21st October, Manila: Asian Youth Championships return to Philippines after 20 years as fifteen countries converged in Manila for the 19th Asian Youth Tenpin Bowling Championships which will begin tomorrow at Coronado Lanes, Starmall EDSA. 60 boys from fifteen countries and 34 girls from nine countries have been entered for the week-long championships which will get underway on October 22. The previous championships held in Macau, China in 2015 attracted 58 boys and 40 girls from fifteen countries. Guam, Japan, Korea, Macau, Malaysia, Singapore, Chinese Taipei and host, Philippines have full teams (4 boys and 4 girls) while Australia has 4 boys and 2 girls. Bahrain, Hong Kong, Indonesia, Saudi Arabia and Kuwait have fielded only 4 boys each. 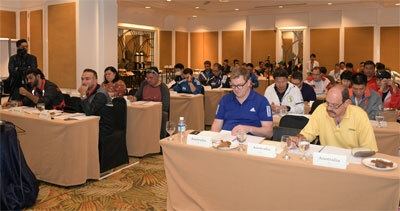 Tournament Director, Dr Danny Santos chaired the team managers' meeting held at EDSA Shangri-la Hotel earlier where players' names were confirmed, rules and regulations elaborated and schedule finalised. Mr Alex Lim, Organizing Chairman and ABF Ex-Co member, welcomed team officials to the championships and thanked them for their support. Mr John Janawicz, technical delegate from Kegel Inc., outlined the two lane patterns that will be used for the championships. The medium oil pattern at 41 feet and and long oil pattern at 46 feet have been circulated prior to the meeting. Dr Santos introduced Mr Bonnie Solis as Host Tournament Coordinator and announced Sheikh Talal Mohammad Al-Sabah, President of Asian Bowling Federation and World Bowling as member of the Jury of Appeal. 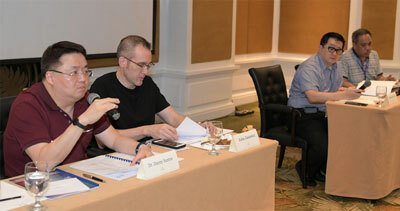 Mr Alex Lim and ABF Ex-Co member, Mr Bandar Al-Shafi of Qatar are the other two members of the the Jury of Appeal. Bowlers will compete in Singles (long oil), Doubles (medium oil), Team of 4 (Medium/Long oil) and Masters Finals (long/medium oil) over six days commencing October 23 at the 38-lanes Corodano Lanes, Starmall EDSA in Mandaluyong City. Competition will kick off with the Singles on October 23 in the morning for the girls and in ther afternoon for the boys. The Doubles will be contested on October 24 while the Team of 4 over two blocks of 3 games each will be staged on October 25 and 26. Official practice divided into two squads will be held tomorrow followed by the Opening Ceremony which will be held at EDSA Shangri-la Hotel. The championships will close with the Victory Banquet at Isla Ballroom, EDSA Shangri-la Hotel.